Alpha Tau Omega (ΑΤΩ) is an American social fraternity founded at the Virginia Military Institute in 1865. The fraternity has around 250 active and inactive chapters and colonies in the United States and has initiated more than 200,000 members. Alpha Tau Omega represents one-third of the Lexington Triad, along with Kappa Alpha Order and Sigma Nu. The Fraternity does not have chapters or affiliations outside the United States. The fraternity’s non-profit organization is The ATO Foundation, which provides scholarships to members. 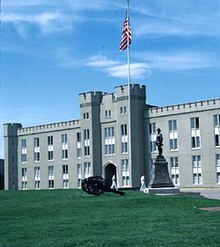 Alpha Tau Omega was founded at the Virginia Military Institute on September 11, 1865 byOtis Allan Glazebrook, Erskine Mayo Ross, and Alfred Marshall. Glazebrook’s plan was to use Christian brotherly love as a way to help facilitate reconciliation between the North and South in the aftermath of the American Civil War. Following Glazebrook, Marshall and Ross, there are two others who are considered “second founders”: Thomas Arkle Clark, the first Dean of education at the University of Illinois who served the national fraternity president for all or parts of four terms, and Joseph R. Anderson who was president during a membership crisis. Alpha Tau Omega has three publications, The Palm, which is the fraternity’s semi-annual general magazine; ATO Leader, which is a bimonthly newsletter for chapter presidents and other organization leaders; and ATO Roadshow, which is a website designed to highlight individual chapter accomplishments and combat negative perceptions of fraternities. The fraternity holds several retreats and training conferences. Altitude is a five-day leadership retreat in the Rocky Mountains. Participants must be in good standing with their chapter in order to participate. LeaderShape was started in 1986 by the fraternity, and was exclusive to members until 1988. LeaderShape was spun off into its own organization which holds week-long leadership and networking retreats for college-age students. The presidents retreat is held every January as training for incoming chapter presidents and vice presidents. The Emerging Leaders Conferences, formerly known as the Regional Leadership Conferences (RLC), is a leadership training conference. In 1935, Erskine Mayo Ross started the Alpha Tau Omega Foundation with a donation of $5000. The foundation is a 501(c)(3) not-for-profit organization that provides educational opportunities and scholarships for the members of Alpha Tau Omega.